Plans to create a modern extension at the front of a local community church have been lodged. 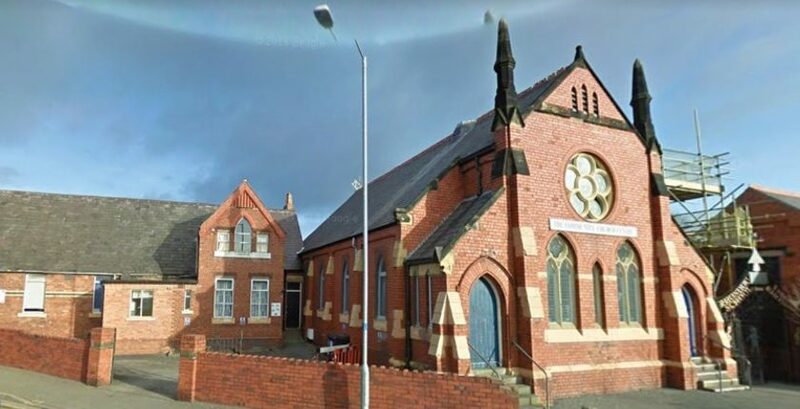 The application for The Community Church on Prices Lane, Rhosddu, will include ramped access to the building, auto opening doors and disabled toilet facilities. The building itself is thought to date back to the late 19th century and is described in the plans as not being listed or falling within a circulation area. Currently the main church hall, which has a capacity of around 200, is predominantly used over the weekend – with a secondary hall playing host to a nursery throughout the week. If plans are approved the new extension will be built on small parcel of tarmac at the front of the church. A refurb of the kitchen and circulation areas will also take place. The applicants conclude: “The scheme provides a much needed expansion for the Community Church and resolves a number of issues such as disabled access and facilities, toilet provisions and resolves the cramped circulation problems. “The scheme removes the dangerous egress from the cramped car park into Prices Lance and provides a modern design with high quality finishes as shown in the artist impressions. “As demonstrated in each of the sections above, we believe that the proposed scheme is in accordance with the local planning policy and that it responds to the setting and church buildings to which it is set.